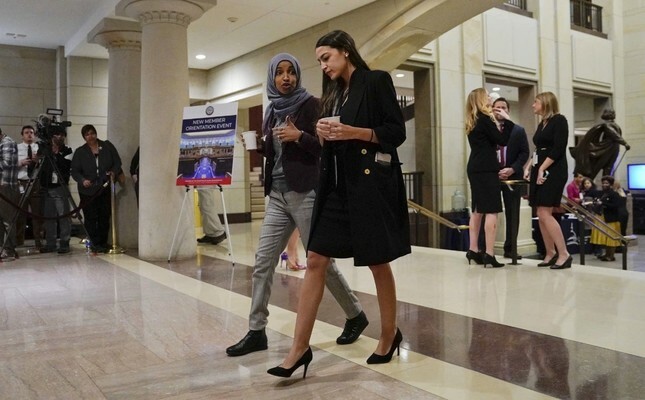 U.S. representatives Alexandria Ocasio-Cortez (R) with IIhan Omar walking in the Senate ahead of orientation program for new members, Washington, Dec. 17, 2018. COLUMNS Would you vote in Israeli elections? COLUMNS What's ahead for Turkish politics? Ilhan Abdullahi Omar, age 37, born in Mogadishu, Somalia, is the U.S. representative for Minnesota's 5th district, which includes all of Minneapolis and some of its suburbs. Alexandria Ocasio-Cortez, known by her initials, AOC, is a representative for New York's 14th district. They were elected in the 2018 midterm elections; they have been in the public arena since the campaign period but in the limelight of public office for the last 160 days. Yet, they are the most-mentioned members of the House of Representatives on TV news. Ocasio-Cortez is the most-mentioned person on Fox channels across the U.S. This is because these two women have intentionally been causing trouble regardless of the consequences; they are brave politicians. They know why the people elected them to office in the first place. Ilhan Omar was elected to the Minnesota House of Representatives in 2016, and two years later she ran for the U.S. House of Representatives. She marks a number of historic firsts: She is the first Somali-American in the U.S. Congress, she is the first naturalized citizen from Africa, the first minority woman from Minnesota and one of the first two Muslim women (along with Rashida Tlaib of Michigan) to serve in the Congress. Ms. Tlaib is a member of the Democratic Socialists of America along with AOC who is also the youngest member of the House. AOC was a waitress and bartender before the election, but she served as an educational director for the 2017 Northeast Collegiate World Series for the National Hispanic Institute. She majored in international relations and economics at Boston University, graduating with distinction in 2011. These three women have been targeted by Democrats and Trump Republicans since day one of their public lives. Mostly men, these groups tried to ridicule, dismiss, minimize and invalidate them at every opportunity. The latest manipulation came from President Donald Trump. On Friday he released a video montage of the 9/11 attacks interlaced with Omar's comments on the acts of terror. Trump took one clause of her explanation of how the Council on American-Islamic Relations (CAIR) was founded and attacked her. Trump and many others that follow him took four words from her one-hour speech and try to make Americans believe that Muslims had ignored the terrible terrorist attacks on the U.S. Rep. Omar said, "CAIR was founded after 9/11 because they recognized that some people did something and that all of us were starting to lose access to our civil liberties." Were we not? Remember the profiling campaigns at airports, train stations and even on streets. Not only Muslims, but also three Indian Sikhs wearing turbans were killed after 9/11 in which "some people did something." "Something" of which even after 18 years, we still don't fully understand. Do we? Almost 2 million websites have lists of "unanswered questions" about 9/11. Yes, as Trump's video says, "We should never forget 9/11," and Rep. Oman mentioned that CAIR is just doing that: It is not an Islamic act – Islam never condones violence against human beings. The president's video montage yet again besmirches Islam as a whole instead of singling out what another politician said. Chris Christie, who served as governor of New Jersey and fell flat on his face in the presidential race, called Omar "off her rocker" and Ocasio-Cortez a "joke" and "an asterisk in history." Following Christie's lead, the New York Post published a dramatic front page with an infamous photo of New York City's Twin Towers on fire with a title that read: "Here's your something." The death threats against Omar started flowing after these attacks. Trump and those who follow him are actually paving the way for future attacks on Muslims like the recent one in New Zealand.